BMW of North America's media buy for the Summer Games will be its largest ever, says marketing chief Dan Creed. BMW has begun releasing details of the splash it intends to make as official automotive sponsor of the Summer Olympics that start next month. The company not only will transport athletes, officials and VIPs around London in a fleet of 4,000 hybrid, diesel and electric-powered vehicles, it also plans an unprecedented TV advertising assault for the brand. BMW replaces Volkswagen, which was global automotive sponsor of the 2008 games in Beijing. In addition to the global tie-in, BMW of North America is the official automotive sponsor of Team USA. The company's activities range from holding Olympics-themed events at U.S. dealerships to using its technology to help athletes improve their performance. BMW signed a deal with NBC to be the only import-brand automotive advertiser during TV broadcasts of the games. General Motors is the official domestic automotive advertiser. "Our media spending during the Summer Games is the largest buy in BMW of North America history," said Dan Creed, vice president of marketing. He would not disclose the amount. BMW's TV advertising won't have an Olympic theme but will focus on the brand's 4-year/50,000-mile maintenance program, the redesigned 3-series and 6-series models and the new Gran Coupe four-door, Creed said. "Just about every car in our product range will be seen in our Summer Games commercials," he said. NBC estimates there will be 26 million viewers a night for the London games, which run July 27 through Aug. 12. 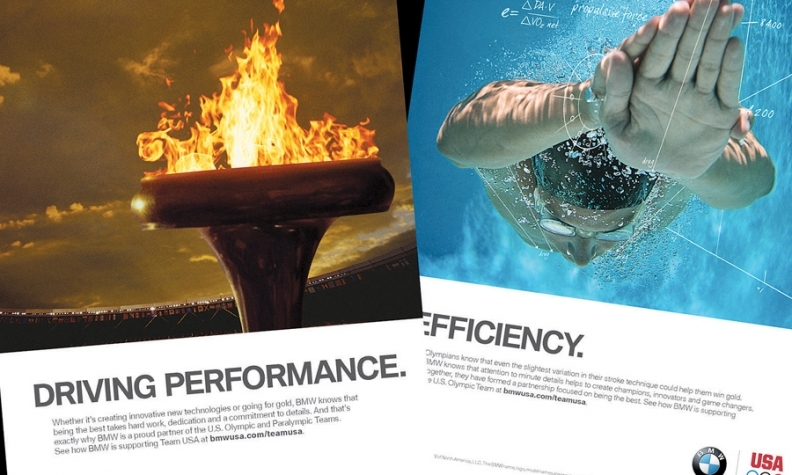 BMW's print advertising will feature 11 U.S. Olympic hopefuls the company said it is sponsoring. BMW would not reveal details of its contracts with athletes. The company has also made available its technical resources to help U.S. athletes analyze and boost their performance. BMW's Group Technology Office in Palo Alto, Calif., uses stereo-vision, robotics and various software to measure the performance of track and field and swimming participants. The technology is similar to what BMW uses to develop object and pedestrian detection safety systems. The sponsorship of Team USA is part of a six-year deal worth $24 million, according to media reports. BMW is the first import brand to sponsor the U.S. team. Although GM will advertise on TV during Olympic broadcasts, it ended financial support for the U.S. Olympic Committee after the Beijing Games. As part of the Olympics marketing blitz, BMW also plans to run humorous shorts on the Internet about the maintenance program that's included in the vehicle purchase price. Last summer the company offered a driving event called "BMW Drive for Team USA," at dealerships throughout the country. Customers took test drives in BMWs and competing vehicles. More than 20,000 consumers participated, and BMW donated $10 for each test drive -- a total of $200,000 to the U.S. Olympic team. BMW resumed the road show In April. Creed said test drives are being offered at 315 locations.